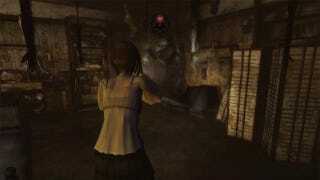 Is Fatal Frame 4 Horrifying or Just Horrible? While Fatal Frame spin-off, Spirit Camera: The Hidden Memoir will be coming to 3DS next month, one major iteration of the series remains a Japan-only title. Fatal Frame IV: Mask of the Lunar Eclipse was released on the Wii back in 2008 and shows no signs of ever leaving its haunted homeland even now. But is the West just missing out on a derivative sequel, or has No More Heroes director Goichi Suda developed a tale as original as it is terrifying? The story of Fatal Frame IV revolves around two girls compelled to return to an island where, as children, they were kidnapped and forced to take part in an ancient ritual. Also returning to the island is the detective who rescued them, still hoping to uncover the mystery of why they were kidnapped in the first place and catch the man responsible. Each of these three characters has a unique story in connection with the island, and while each appears largely unrelated to the others as you rotate through them chapter by chapter, they all eventually tie together to complete the overall narrative. Good — Who Knew Japanese Mental Hospitals Were So Creepy? Past Fatal Frames have taken place in the ruins of a traditional mansion, village, and nightmare castle respectively. Fatal Frame IV goes for a much more modern setting: a hospital. While the game begins in a traditional Japanese mental ward, later chapters explore both the hospital proper and several modern houses as well. This change of scenery is a welcome addition and makes for an excellent backdrop to a medically-based horror story. gameplay change is the inclusion of the Spirit Stone Flashlight—a more rapid fire weapon than the Camera Obscura—but for all practical purposes, it plays almost identically. Really, in most ways the game just feels like more of the same, which is, in and of itself, a double-edged sword. Anyone hoping for revolutionary changes to gameplay will find themselves disappointed—as will any who have grown tired of disturbing ancient rituals, facial distortions, long-haired dead girls, and other Japanese horror staples. But those who just want more Fatal Frame in their lives will feel right at home with this iteration. Mixed — You Want it in English? Bam! Here it is. The most exciting addition to Fatal Frame 4 isn't even included in the packaging. We've talked about the fan-made English translation patch on Kotaku before, but as awesome as it is, it's not perfect. While I have no complaints about the translation or English presentation of the game, installing the patch can be anything from a slight hassle to downright impossible. While Tempus and his team have worked hard to make the process as easy as possible—and even provide support and troubleshooting to this day—the fact remains that as an unofficial hack, there can be problems in installation. Personally, I have set up the English Patch on three different Wiis: the first never got past the loading screen, the second patched perfectly the first time, and the third worked after a bit of troubleshooting with Tempus. So while the English patch itself is a great thing, getting it to work has the potential to be problematic. case. Instead, the tilt sensor on the Wii-mote controls the vertical-axis while the thumbstick on the nunchuck controls the horizontal-axis. Moreover, the trigger button is used to ready the camera while the Wii-mote's "A button" is used to snap pictures—the opposite of every other Fatal Frame as well as TPS/FPS games in general. Even dodging—by far the most important mechanic to master in Fatal Frame IV—is a waggle command. In all, this results in one of the most counter-intuitive control set-ups ever, and it takes hours of play just to get used to, much less to become proficient in. Add to that the Wii-mote's lag and you sometimes feel as if you're fighting the controls as much as the ghosts. It really is a mystery why Fatal Frame IV: Mask of the Lunar Eclipse never received an international release. Other than the annoyingly frustrating controls, there is little to dislike in this excellent iteration in the series. If you are a Fatal Frame fan, this is definitely one you will enjoy; so import and copy, download the patch, and get to playing.